English language school Malta - English course by the sea! Enjoy a unique climate with temperatures of up to 17°C in wintertime and during the rest of the year constantly warm summer temperatures while improving and developing your English skills! Our partner English language school Malta has a very high international academic standard. Their key strengths lie in the provision of quality English Language Courses with teachers who are sourced from around the world and are required to be native English speakers, as well as offering a complete package of activities, social excursions and a wide variety of accommodation options. You can stay in one of the school’s exclusive shared self-catering apartments, which offer you the great opportunity to meet new people and are within a 5-15 minute walk from the school. Alternatively you can stay in one of the selected host families and study the English language in the real world. You can find information material about the English language school Malta here. The English language school Malta is located across the road from the water’s edge in St Julian’s Bay – one of the best locations in Malta. It is overlooking the picturesque and vibrant bay of St Julian’s which is surrounded by highly rated Mediterranean restaurants, cafes and bars and offers a bubbly nightlife. It is ideally situated in a recently renovated historical building in the historical part of the town. Why Malta is the perfect alternative to an English language course in the UK? Malta has a subtropical climate which means it is warm and sunny whereas Great Britain is usually rainy and cloudy. Malta offers you a very exciting daytime and nightlife program. The swimming season lasts from May to October and you have the sea directly on your doorstep. Malta is an island with a rich culture and history. It has a number of cultural monuments that are part of the World Cultural Heritage. Our partner language school offers you an intercultural environment. This helps you to spread your connections over the whole world and build new friendships. Firstly, Malta offers various sport activities which set up a paradise for fans of water sports like diving, parasailing, jet skiing, wakeboarding, deep-sea fishing, windsurfing, snorkeling, swimming and harbor tours. Besides, Malta’s landscape also gives perfect opportunities to discover the island. For exaple, within a mountain bike tour, a hiking or climbing excursion or to enjoy the nature during golfing. 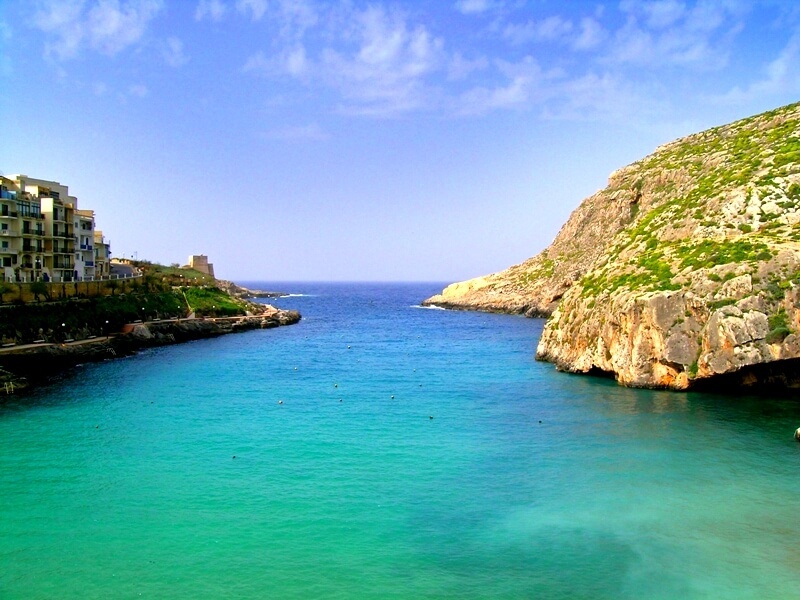 After your daily portion of sports you can relax on one of Malta’s sandy beaches, rocky shores or in the small bays. Furthermore, you will find a lively night life, offered in many bars and night clubs. If you want to enjoy a more chilled afternoon, relaxing and socialising in a less crowded space visit the ice rink, the bowling alley, the casino or go to the IMAX cinema with 16 screens. Also, the school can arrange go-cart, laser tag and paintball events. Visiting the capital city Valletta, the former capital city Mdina and the neighboring islands Gozo and the offshore island Comino with the Blue Lagoon are absolute must-experiences! There you can feel the turquoise crystal- clear water, the Caribbean flair and sunbath on the white sandy beach. Nearby the numerous activities on Malta, there are several famous events on the island spread over the entire year. You have the chance to see Malta’s population in colourful costumes and a great parade during the Carnival in the end of February to the beginning of March or join lavishly decorated churches, which glow in the evenings and the magnificent Easter church parades during the Easter Week in April. If you like to see musicians playing on the street corners in the entire city, set in a ´Middle Ages´ atmosphere, you can visit the Medieval Mdina Festival in May. Music-interested people have a widespread offer of different festivals like the Isle of MTV Malta Special and the L´Imnarja Summer Folk Festival in June and the Malta Jazz and Rock Festival in July. However, Sports interested persons can join the Malta Open Championships for Bowling in April or the Rolex Middle Sea Race in October which consists of a 606-sea-mile journey from Valletta´s harbor and passes the Strait of Messina along the eastern coast of Sicily. Additionally, there is the Malta International Fireworks Festival, the Malta Arts Festival, the Earsons Great Beer Festival and several Village Festivals spread over the whole year.